With now eleven years in the NHL, we are all aware that there is almost nothing Sidney Crosby can't do. He has won the Stanley Cup (twice) and just about every other individual award the National Hockey League can bestow upon one player. Let's not forget the ESPY Awards and all the other achievements/awards from outside the NHL. Sidney Crosby has even been immortalized on a Canadian Postage Stamp and if we lived in the fictional world of Harry Potter, I am pretty sure Sid the (grown up) Kid would break the record for winning Witch Weekly's "Most Charming Smile". What more is there to win for one of the most decorated hockey players of the 21st century? Yes, that was read correctly. An Emmy. The award for excellence in the television industry. You can read more about it here. No, an Emmy was not awarded to Sidney Crosby for a single hockey game. That would be too easy and good luck choosing just one to honor. This Emmy was won for Sid's starring role in "There's No Place Like Home with Sidney Crosby". The program was produced by the Penguins and was awarded in the "Sports Program One-Time Special" category by the National Academy of Television Arts and Sciences Mid-Atlantic chapter. Stanley Cup's. Conn Smyth. Hart Memorial Trophy's. Art Ross Trophy's. Ted Lindsey Award's. The list goes on and on and on and now Sidney Crosby can add an Emmy to the trophy case. What is next for our fearless leader? Another Stanley Cup? More Espy Awards? A Teen Choice Award? Or should be just quit hockey all together and go for the Oscar? 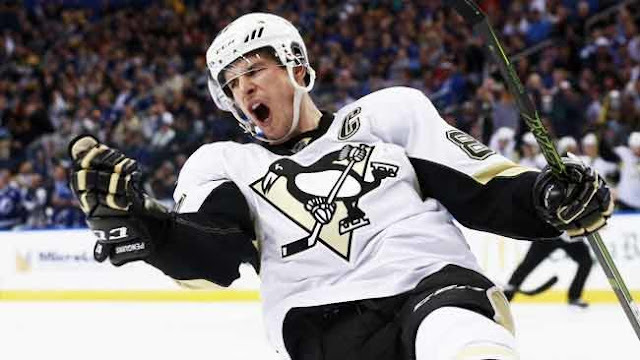 Whatever is next for Sidney Crosby, we can all be glad that he is a Pittsburgh Penguin above all.